National and International media sources [ BBC | AlJazeera ] are reporting a combination of mainly Pashtun ISIS and Taliban terrorists, including their ‘foreign’ allies, brutally slaughtering dozens of Hazara men, women, and children in MirzaOlang village in Sayyid district of Sar-e Pul province in Afghanistan. The Etila-aat Roz (Daily News) quoted Governor of Sar-e Pul Mr. Mohammad Zahir Wahdat “Taliban and ISIS are slaughtering Hazara families one by one like sheep” and pleading for urgent help from Kabul Government and NATO. The army, the police and the intelligence are dominated by one ethnic group and they know what to do, where to send reinforcement and where not to. Mirza Walang is not the only place where pleas for sending reinforcements were refused or not heard. ANALYSIS: Why the Sunni-Shia Schism is false narrative in Afghanistan? In the aftermath of every attack on Hazaras in both Pakistan and Afghanistan, media report the attacks as ‘Sunni-Shia’ schism fight. 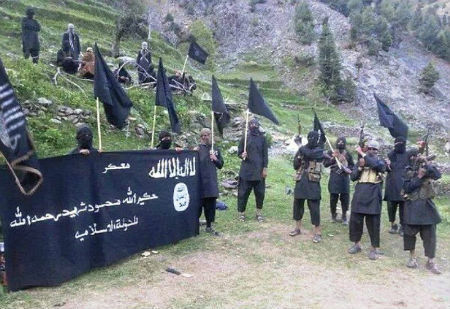 The attacks by ‘ISIS’ in Afghanistan is particularly attracting attention with most headlines like ISIS trying to foment sectarian war in Afghanistan. This narrative, without providing proper context, shows either Journalist’s unfamiliarity with the history of the region or the flagrant disregard of it. What is meant by ‘ISIS in Afghanistan’? Historically and during ‘current era’ (1990’s onwards), following ‘groups’ in Afghanistan have persecuted Hazaras: Taliban, AlQaeda, ISIS, Kochis, Afghan Goverment – all ethnic Pashtuns. Idoeology – Sunni Deobandi, the Pakistan-variant of Saudi Wahhabism. Deobandis are known to attack secular Sunnis (Barelvis – ideologically and politically closest to Shias), Sufis (mystics that has both Shias and Sunnis) and minorities like Hindus and Christians. Grassroot Support – 1000s of Saudi/GCC financed-madrassas mostly in Pakistan. In AF-PAK, you can identify all of them by their distinct signature pattern – all hold madrassa Haqqania (aka ‘Univ of Jihad’ in KPK, Pakistan) in high esteem. So, ‘what is ISIS’ may just be a fighter that changes from all white attire (Taliban) to all black (ISIS). Image showing ‘ISIS in Afghanistan’ eulogizing their Pakistani TTP leader, Hakimullah Mehsood, who was killed in the US drone attack.